Review: I did not know anything about the author or the novels and I confess that when I received the book, I was not sure it would be for me. Why is that? The cover didn’t really attract me that much (yes I’m superficial). Yet I had a great time with this story that compiles the first and second book in the series. Miriam’s life will change overnight when she is fired from her job with her ​​assistant after finding a huge scoop combining a large number of important people. At the same time, her adoptive mother gives her a box with items that belonged to her biological mother. There she discovers a locket that will completely change the game! Oh yes, because the young woman discovers that the object can allow her to travel from one world to another, a very different world from hers in regard of technologies. In fact, everyone seems to live in the Victorian era, all controlled by clans, a kind of mafia that earns large amounts of money by doing business between the kingdoms. It is in this context that Miriam appears, learning that she is the daughter of an important (and murdered) woman of the clan. But this fact complicates everything because it seems that many people now want her dead. And as she tries to understand with the Roland’s help, a member of her family (and maybe more), who she is and what this world hides, she will also understand that there is more than all this. Miriam is full of revolutionary ideas and she is determined to change the laws governing the game of power and money. So we’ll go on an adventure while following this heroine to discover the secrets of the worlds. I took great pleasure in discovering this story. The author has created a completely amazing universe! I confess that I did not expect that at all, but it was fascinating to discover what these worlds could conceal. Although we have similarities with ours, their past, their history, their advances are all different. But Miriam is determined to shake the clans, and it’s true that I was really curious to see what she would do. This young woman is amazing! She is projected in a life she does not know anything about and she will have to adapt very quickly. And even though it will be very hard to know who she can turn to and who she can trust, she will have to choose her allies to thwart all the multiple attempted murder against her. But Miriam is much smarter than it appears to be and I did not expect to find such a plan for her. Our young heroine will join forces with a few people who will help her throughout the story and that we enjoy exploring about. The author did a great job on his story, worlds and details. It is even very difficult to know exactly what people think and their ulterior motives and it’s true that everything keeps us in suspense throughout the book. I do not want to give too much away but I can tell you that this novel is a mix of conspiracy, betrayal, murder and money. An explosive mix and I look forward to reading the sequel! 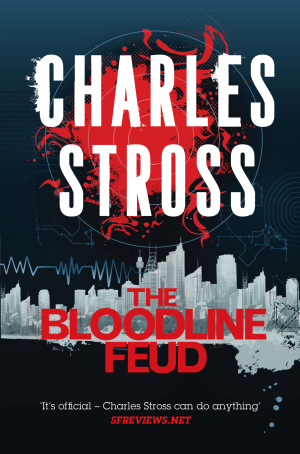 This entry was posted in Charles Stross, Fantasy, The Merchant Princes. Bookmark the permalink. I haven’t heard about this book before, so, for starters, thank you for sharing. Oh, I love it when the writting is done so masterfuly that it keeps you on your toes until the very end and when you can’t even guess what would happen. My pleasure. Yes I was so surprised but it’s very well done! Yeah, cover is putting me off too. So happy it ended up being good. yeah I can read a book only because the cover is pretty. Well in fact I do that a lot. I love that this kept you in suspense! I confess I had no idea about this book and then you mentioned time travel and my eyes popped open. The cover is meh..but ooh I love the sound of the world building and characters. no time travel, it’s mainly world travel. They were very well done. I love when you end up loving an undiscovered book! And while it’s not a genre that I purposely seek out, I can appreciate a well-conceived book, and one that has outstanding writing. it’s not really a genre I enjoy but it was a nice surprise here. yeah! I really enjoyed that too. It sounds interesting. It’s not really my type of story, but I know some readers who definitely would love it. An explosive mix? Now, that’s what I call a good recommendation. I’m intrigued by the fact that with its clans etc it was like everyone lived in the Victorian era. yes it was so interesting to have so many things in one book. lol yes the mix is really interesting. so many things! you’re right. Yeah, I’m glad I tried it! I still have plans to read this one, but I’m not surprised you beat me to it 🙂 So glad to hear this was good, I’m looking forward to it. Always been curious about Stross. I’m trying to read them as soon as I have them. I’m curious to see what you’ll think of it. I like the cover and a male author is always a good thing, they have a way of telling a tale. This is right up my alley, thanks for the head’s up! Oh. Now I like the sounds of these. I wasn’t sure at first seeing/hearing about it but now it sounds like something I’d enjoy. 🙂 Thank you. yes it was really great! That blurb sounds super interesting and to have your review confirmed it makes even more appealing. I don’t do that because too many books to read but it’s nice to be surprised sometimes when the publisher sends you a book you don’t know about. LOL well I’ll join you in not being all that taken by the cover. That’s awesome that it turned out to be a good one!